One of the few downsides to living in the otherwise fabulous light-industrial cityscape that is the suburb of Cremorne (not to be confused with Richmond - see my earlier rantings on this subject) is that most of the little cafes dotting the suburb are closed on weekends. This appears to be a sad financial necessity (despite the best efforts of DJ and me) dictated by the fact that most of the suburb's hustle and bustle leaves with the Monday to Friday 9 to 5ers. Hell, even The Cherry Tree is closed on a Sunday! Cafe-wise, things are looking up in our corner of the world with the newish addition of Pearl Cafe (more about that in an upcoming post), but DJ and I have had our eye on Volley Cafe since it opened a few months ago. 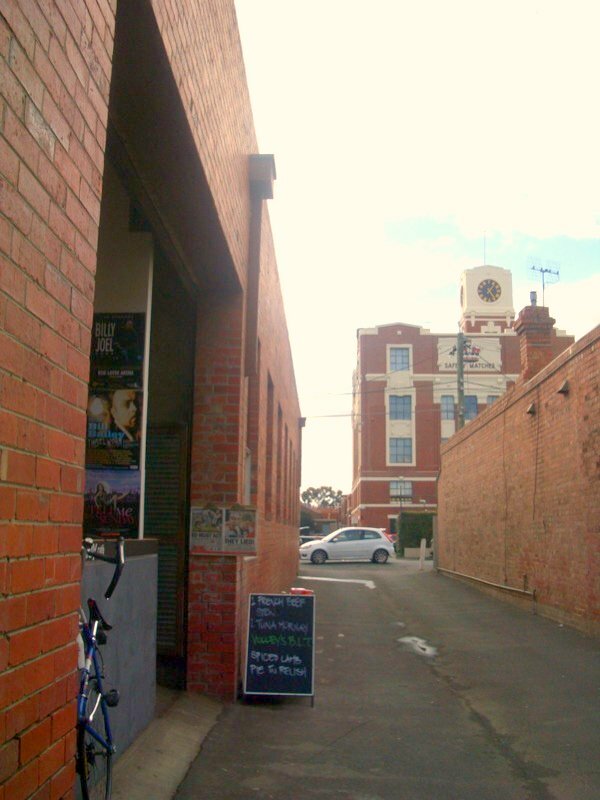 It's tucked away down a laneway off Balmain St, opposite the tennis courts at the Bryant & May Factory (one of my top 10 favourite buildings in Cremorne). Anyway, back to Volley. 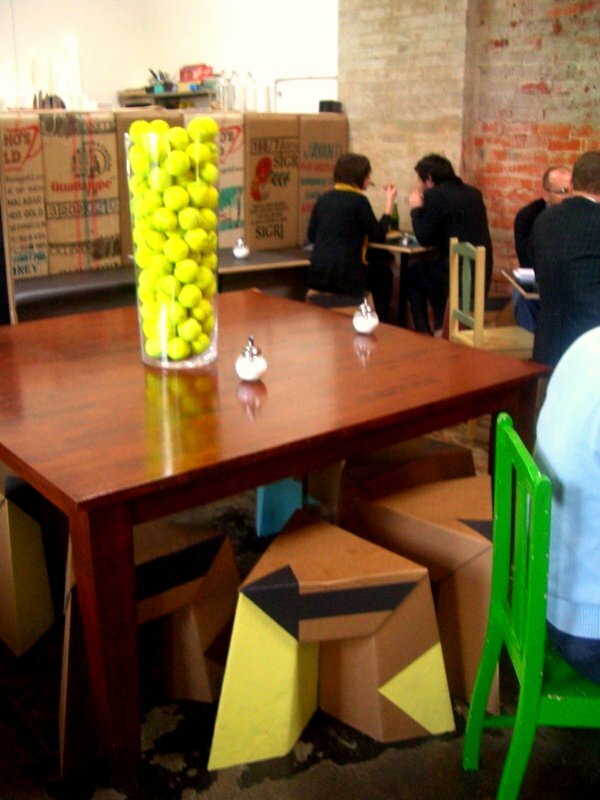 In keeping with its name and proximity to the courts, the cafe boasts a simple but impressive tennis-themed centrepiece on its communal table which you can see in the photo below. The other eye-catching items are the wallpaper of recycled coffee bean sacks made of hessian, and the stools made entirely of recycled cardboard. The latter are the handiwork of local designer Anthony Dann, who won a sustainable design award for them. They weigh hardly anything but according to Dann's website they are load rated to 150kg! 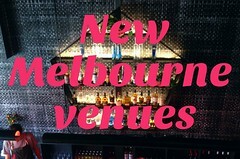 Find out more at Paper Tiger. Today the opportunity to visit Volley during opening hours finally presented itself because I'd taken a half day of leave to attend a medical appointment. I walked in and couldn't decide which of the several yummy-looking pide to choose from, so instead opted for one of the daily specials - Tuna Mornay ($9), a dish I hadn't had in about a decade! 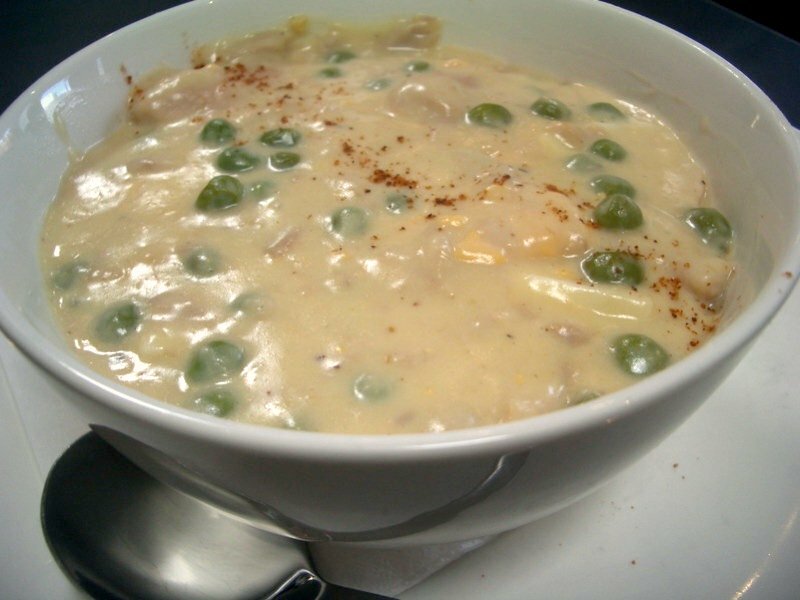 It was very tasty - creamy but not oppressively so, studded with large peas and with a layer of rice underneath. 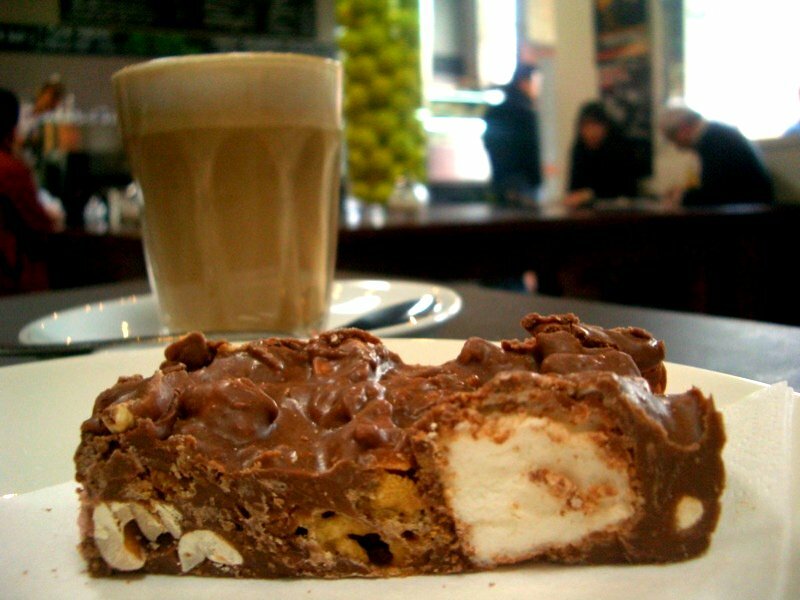 I'd seen slabs of Rocky Road up at the front counter, so decided to request a slice with my coffee. "Sure. Which flavour rocky road? We have honeycomb, Cherry Ripe or original." Three flavours of rocky road - how awesome is that?! I went for honeycomb - it crunched beautifully with the macadamia nuts. Coffee was excellent. I've lived in the area for two years now and always thought we were light on for good cafes. I read your review and was quite excited to visit. WHa t a shame it didn't live up to expectations. Way too cold. Ok so it was a cold windy day, but theres no door. On top of that I thought the coffee was average. DIdn't stay to eat. Pack ski gear if you plan to stay longer than 5. Hi Johanna - oh I too am a samurai sudoku FIEND. I also like the General Knowledge crossword - sometimes I call my Mum as I'm looking at it, and we solve it together over the phone. 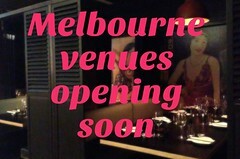 Can't wait to go check out the Cherry Ripe rocky road at Volley! Hi Gabby - I'm sorry to hear Volley didn't live up to your expectations! I happened to visit on that unseasonably warm day last week, so I didn't notice the cold. But having no door during this bleak week would suuuuck. Maybe it's best left until midsummer for a revisit? 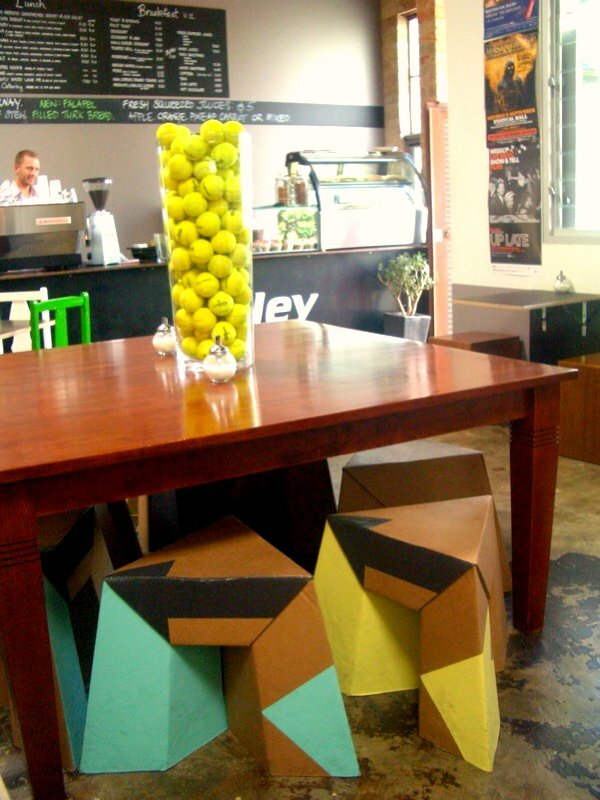 I checked out the Volley cafe after a recommendation from a friend who lives in Richmond. The roast lamb focaccia was beautiful and the coffee was the best I've had this year. 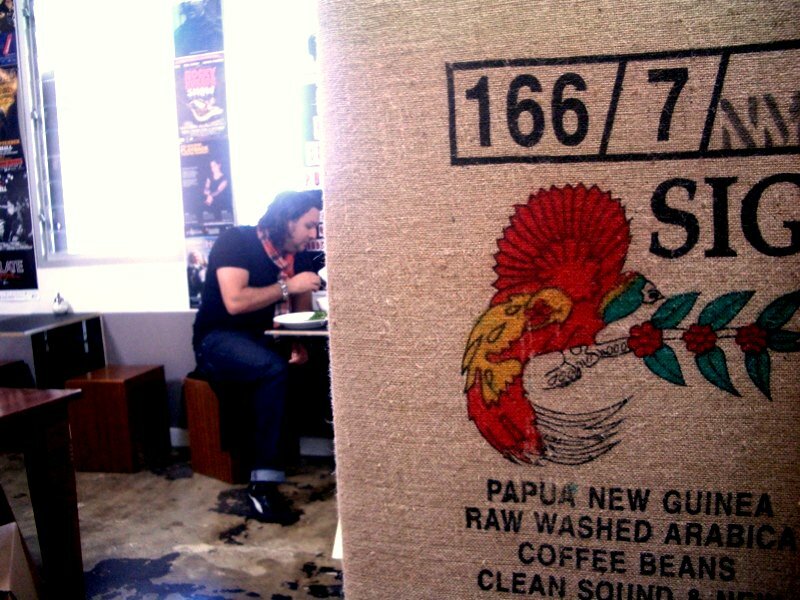 If this was he best coffee you had all year you need to visit some more places! Not my cup of tea. Think I should have had a cup of tea. Try Pearl Cafe on Church St. We walk past Volley to get there. Well worth the walk. Great coffee, great food, and most importantly, great service. We got very rude treatment from the girl at Volley the two times we tried.